Happy short-work-week and unofficial beginning of summer! Our weekend was filled with the perfect combination of family gatherings and building in our woodshop. I snapped this picture of the twins at the park on Sunday, and I’m so glad I did! Because the more I think about it, the more I realize that there are very few pictures of JUST the two of them in the last few years. 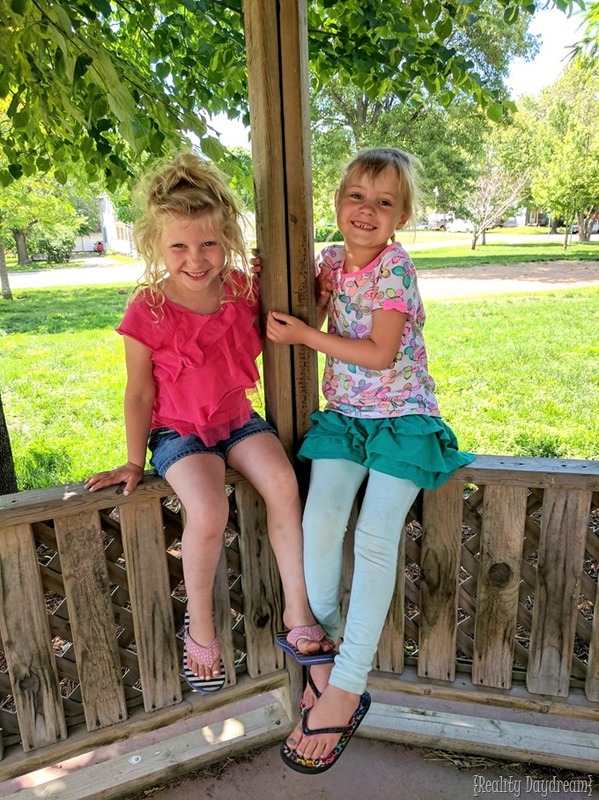 Little sister Cypress has infiltrated our lives in the best possible way… but that doesn’t mean I can’t force the twins to sit together and look cute for a minute. Anyway! I don’t always remember how ideas come to me, especially when they just simmer in the back of my head for months… like today’s project! But I’m so glad I finally pulled the trigger on this, because it turned out SO AWESOME! This is one of those fun projects that is amazing to watch come together before your eyes in a time-lapse video… so I made one for you! You can get the jest of all the steps from the video (and how EASY it is! ), but I’ll list out the steps below too. P.S! If you’re reading this in a reader like Blog Lovin or Feedly, you’ll have to click through to the post here to see the video. Sorry! 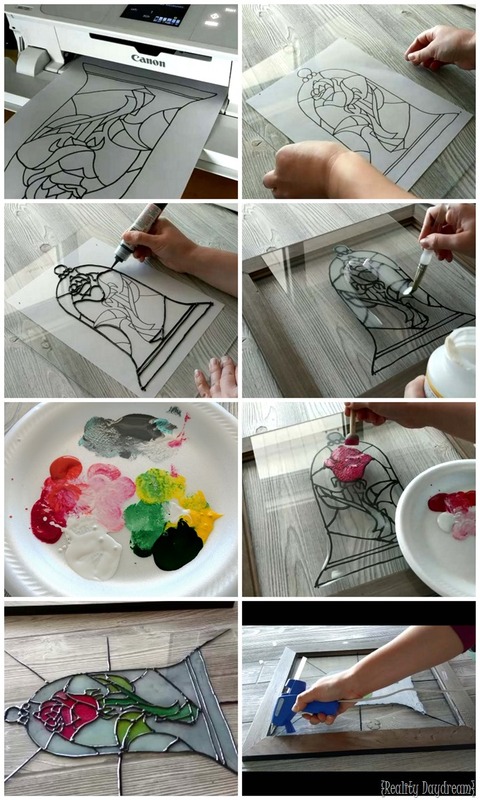 3) Flip the glass over and prop it on the back of the frame so that the design can dry while you paint the back side! Brush on a thin coat of ModPodge to the back side of your design. This give the glass a ‘matte’ surface for the paint to adhere to. Give it a half hour or so to dry. It will be completely clear when it dries. 4) Time to add some color with Unicorn Spit! For the bloom, we used red, pink, and white. For the stem, we used green, yellow, and white. And for the cloche, we used gray, teal, and white. Just kind of blot with a circle foam brush to get different combinations of colors to give your painting more dimension! There’s no artistic value to this… I promise. Just blot away! 5) The Unicorn Spit will dry within the hour, but the Allure Dimensional Paint will likely take 24 hours or more to dry. Especially if you have some larger globs. I ended up going back and adding some lines to the clear glass part to make it look like smaller pieces of glass leaded together. You’ll see what I mean in the image collage below. 6) Give the clear glass parts a good wipe-down to get rid of your fingerprints, and pop that sucka in a frame! I used a hot glue gun to squirt some blobs where the corners of the glass meet the picture frame to prevent the glass from falling out or wobbling. And you’re ready to hang it on the wall! It looks SO MUCH like legit stained glass! So stinkin’ FUN, right?! And let me tell you, this is easy enough for the kiddos too. 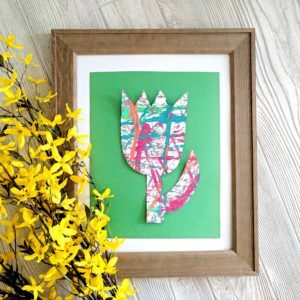 My 5-year-olds LOVED this craft, and even though they were a little sloppy, it still ended up looking pretty amazing! AND, I decided to get fancy and try the more intricate design. It’s not perfect, but I think it turned out pretty good. Everything about this project was so FUN! Do you think you’ll give this a try? Either by yourself or with your kids?! Of course you know that the sky is the limit with ideas for different ways to use this technique. Any stained glass design would be amazing! You’re not limited to Beauty and the Beast theme! 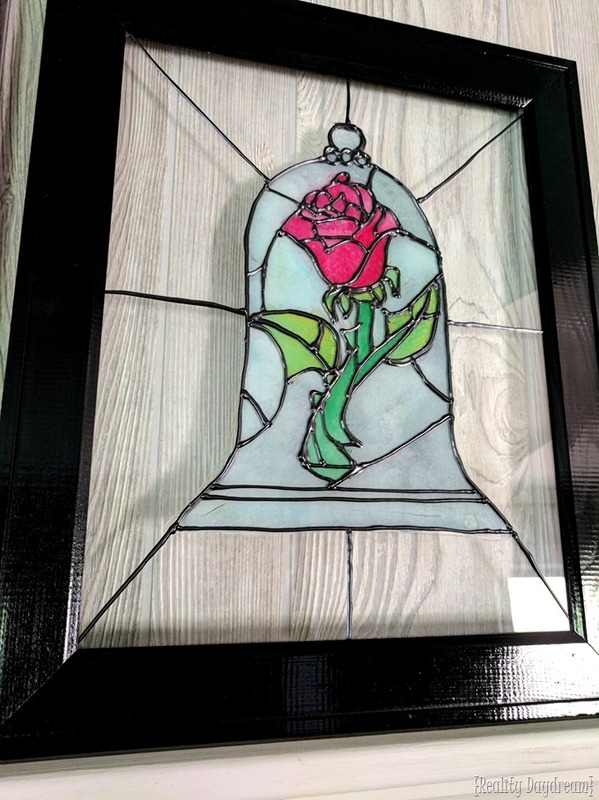 Next, I need to try my hand at ACTUAL stained glass techniques. My mom is really good at it, but I’ve never tried! 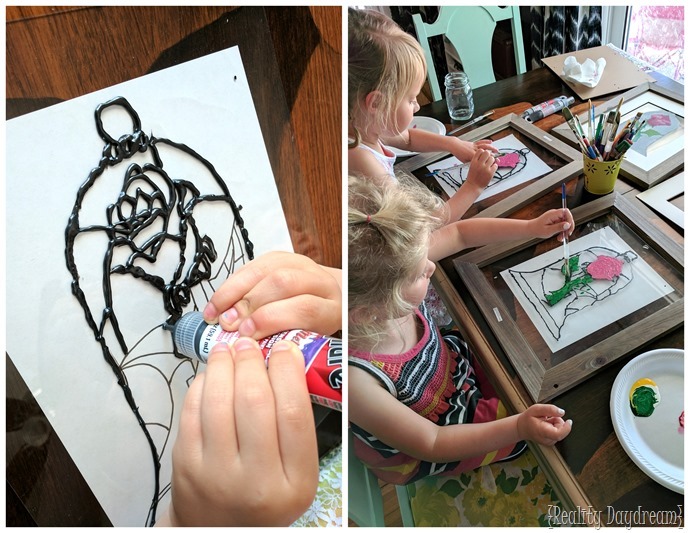 Easter or Spring-themed Kids Craft …MARBLE PAINTING! I think the artist should create their own patterns otherwise stagnates creativity. Beautiful. Your project showed up in my memories from 2017 on Facebook. I’m so glad that it showed up again. Ordered supplies on Amazon today. You truly have a wonderful gift. Your art and your kind responses to all of us. Thank you. 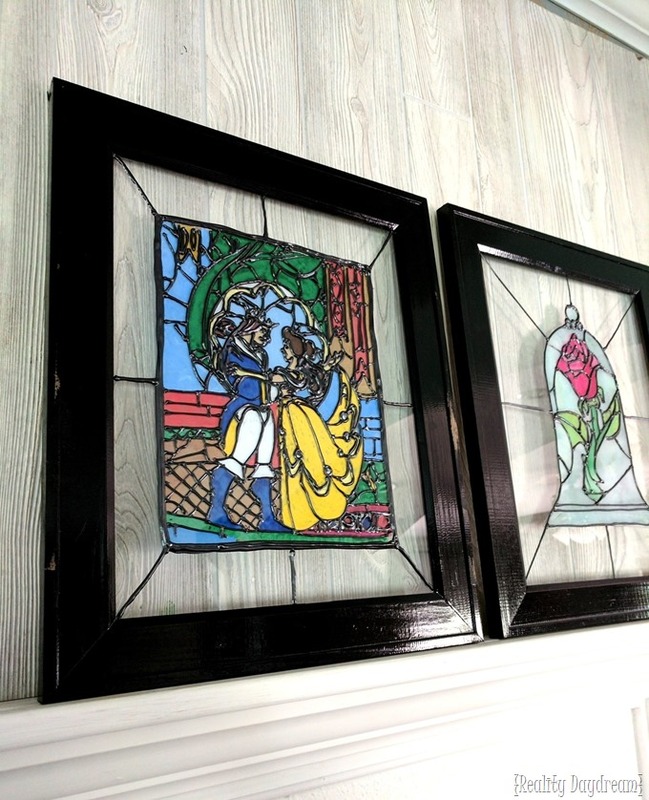 Do you know if the finished product would be damaged by the sun or heat if hung in a window? It’s been almost a year, and mine looks fine. But I can’t speak for longer than that. I have had the faux stained glass on my front door for twenty years…still looks great. If you are a smoker…the discoloration can not be removed! Thanks for the great idea! I actually did a large poster sized stained glass for my niece for Christmas inspired by this! is it possible without that white stuff? Hi Leon, The white stuff is what makes the paint stick to the smooth glass. 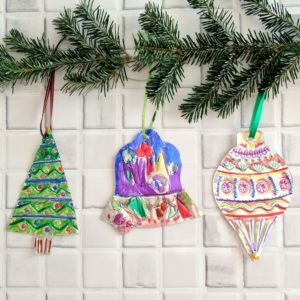 Do you have any decoupage products in the Netherlands? Any brand would be fine. So not everyone can afford unicorn spit is there another alternative that would give me the same effect? I haven’t tried it, but I would think acrylic paint would work out fine. Let me know if you give it a try! Hello! Did you ever try or hear back if the acrylic paint works as well as the unicorn spit? What size bottles of unicorn spit do you need for this project? Thanks! This looks so awesome! I can’t wait to try. Unfortunately I haven’t had a chance to try the acrylic paint, but in theory, it would totally work. It might just not have as much of a translucent look. You should go for it! Let me know how it turns out! I haven’t tried with acrylic paint, but in theory it should work! It might not have the same translucent look, but if it’s on the back side of the glass, it will still look like colored glass. If you give it a go, let me know how it turns out! 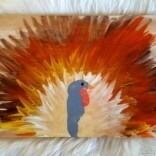 How did it turn out with the acrylic paint? It is tfuly a great and useful piece of information. I amm satisfied that you simply shared this useful information with us. Please stay us informed like this. Thanks foor sharing. I Would love to give this a try do you know any where in uk or anywhere tvat delivers to uk for the Allure Dimensional Paint? Or something the same i can use? Yikes, I have no idea about ordering things internationally. I’m so sorry! Hi. Did this and looks pretty good. Thanks. I cant find any different one to do. Do you know of any web site where I can get different mosaic graphic to print? Thanks again for tutorial. If I were you I would just do some Googling! As long as you don’t try to sell them, it’s not illegal to use images as far as I know. Check out different coloring books… from extremely simple to more complicated. I’m sure you will find something that appeals to you. Good luck! That’s so smart Christyll! Thanks for the tip! Look for Dover books. They publish some stained glass coloring books. Or check out your local craft store. Hi, I’m from Brazil. I made this art but in a painting, I painted and I loved it, thanks for the idea, hugs. 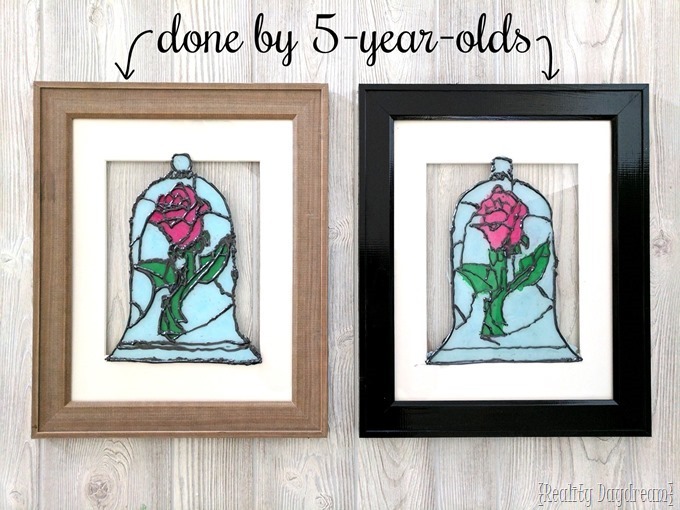 How does the paint adhere to the Mod Podge if it is on the backside of the glass? Maybe I am misreading the directions. The Mod Podge and Paint are on the BACK side of the glass. And the Allure Dimensional Paint (puffy paint) is on the front! Does that make sense? Love the idea. I have been wanting to do the windows in my front door for privacy..but still to get light without using a curtain. Thanks for mentioning the name of the allure paint. Now i have even more ideas! I made this with a cross for the cross wall in our house and it turned out great! I used folk art acrylic paint because the Unicorn Spit was so expensive and hard to find. That’s awesome! I’m glad the acrylic paint worked well! Looks amazing! I’m curious though. I haven’t been able to find this dimensional black paint anywhere but Amazon. Says it’s a 2 month waiting period for the stuff. When I try to research other mixed media multidimensional paints nothing comes across. I only see the Tulip Fabric paint. Is there another alternative? Also what makes Unicorn Spit special in this process. Are we able to substitute just acrylic paint? I have a ton of that already lol. That’s so weird that it’s such a long wait time for the Allure paint. I saw it at Hobby Lobby the other day, so you should totally check there! I saw that as well and after some research I saw Michael’s carries a brand called PÉBÉO VITRAIL RELIEF OUTLINER that might work as an alternative. From what I see online it might even be a bit cheaper then the Allure paint. I’m planning on going into Michael’s in the next few days to check it out. I’m excited to do a few landscapes of these for my sister and brother-in-law’s living space. Has anyone tried putting this in a window yet? I am wondering how well this will hold up to the sun and heat. I haven’t tried that yet Vicki… so sorry! I’m not sure if it would fade or not. Do you think one could use this technique with plexiglass instead of glass? 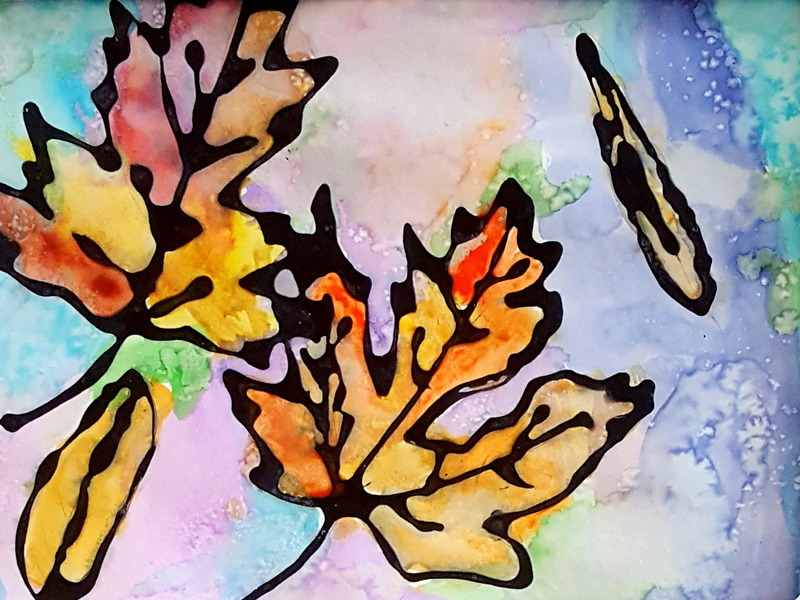 I’d like to do a large piece but glass would be heavy and also for safety reasons I would prefer it not to be glass. Vicki, I’m not sure about plexiglass, but in theory it would work. Let me know if you give it a try! Do you know if this paint fades in the sunlight? My daughter did some suncatchers and they faded into nothing and she was very upset. These would be so pretty in the window if they don’t fade! Yikes… I’m not sure if they fade or not. But I agree that these would look so pretty in the window! This is genius! Thank you so much for sharing!! Michael’s carries it, but about 14.00 each. This looks AMAZING! Yes, I will try! But that Unicorn spit is soooooooooooooooooo expensive – $10-$20 per bottle! You’re right it is a little pricey. But it is SO concentrated and goes so far! I’ve been using the same bottles for 2 years now! If that helps?! I am so excited to try this, but I was wondering if I have to use the unicorn spit. I seem to be having a problem finding it local. I’ve heard they carry it at all the big craft stores and home improvement stores now, but I haven’t checked for myself. I’m guessing you could use acrylic paint instead and have a very similar effect. YAY! I think they will love it! Beautiful. The kids are so smart. I wish I can do that too. What a fun creative project! Love it.